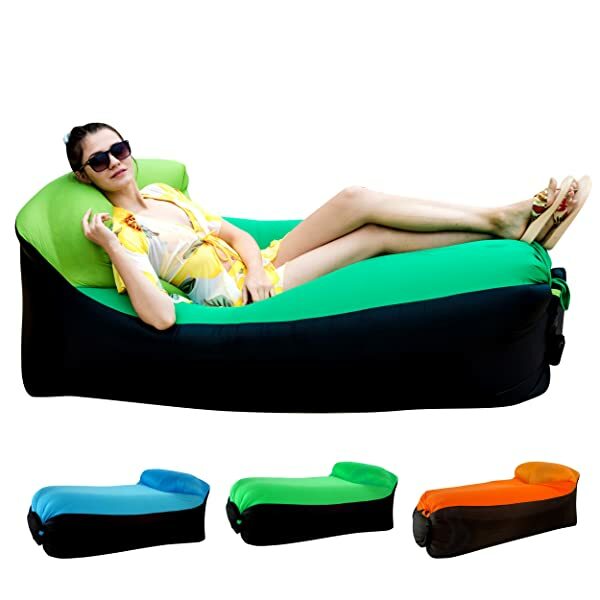 The Chillax Inflatable Lounger is a modern air lounge that will ensure that you always get an unforgettable experience in your backyard or the pool. It is a multilayered nylon material product that is durable and water resistant. 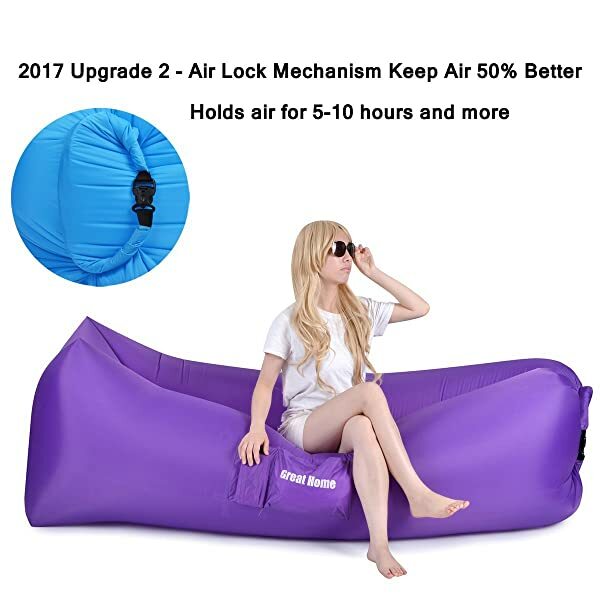 This air lounge is easy to inflate, and it only takes about a minute to fill up. It has three pockets that you can use to store the things that you need when relaxing on the air lounge and it also comes with a carry bag, securing stake and a bottle opener. ChillaX can float on water, and this makes it suitable for using in the pool. 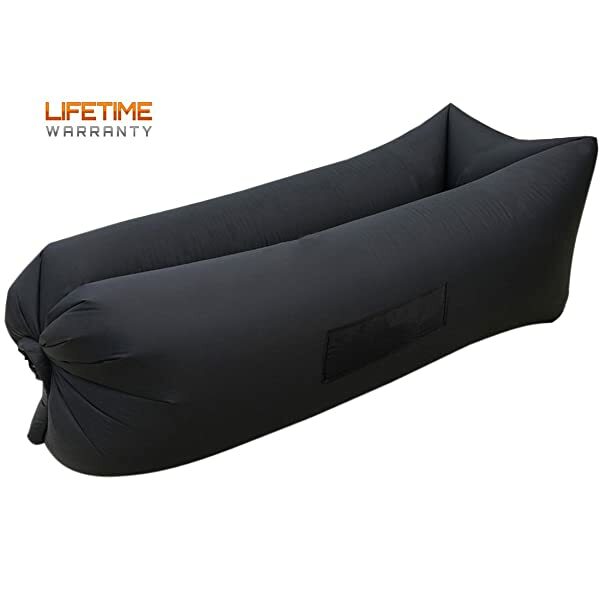 It is easy to inflate, and you will not even need to use a pump. The material is multi-layered which makes it thick and very durable. You will only need a minute to get it to maximum inflation on a windy day. It comes with a headrest that makes it very comfortable to relax on. You get an extra carry bag that will make transportation and storage easy. Unlike most others, it comes with three different pockets for a book, phone, and bottle. Securing stake will ensure that the wind does not blow it away. It is water repellant and very easy to clean. It deflates quite fast even when you get it to the maximum inflation level. Some users complain about how difficult it is to inflate on a windless day. Using it on sunny days is not very comfortable as it gets hot. Although the nylon exterior is tough, you still cannot use it in very rough terrain. It would be better if the pocket were a little bigger. Material: It has a multi-layered nylon material that is thick and very durable. This material is also water repellant which means it can float on water and it is also very easy to clean. Inflation: You only need to catch the wind to inflate it, and so no pump is necessary. Inflation is also easy on a windy day, and it will only take about one minute. Colors: There are more than enough options available when it comes to the colors. It is available in some bright shades that include green, blue and orange. Pockets: ChillaX comes with three different pockets that you can use for your phone, water bottle and a book. Extras: When you buy this air lounge you will also get a nylon carry bag for storing and transporting it, a bottle opener and a securing stake. It also has a headrest that will give users some extra comfort. 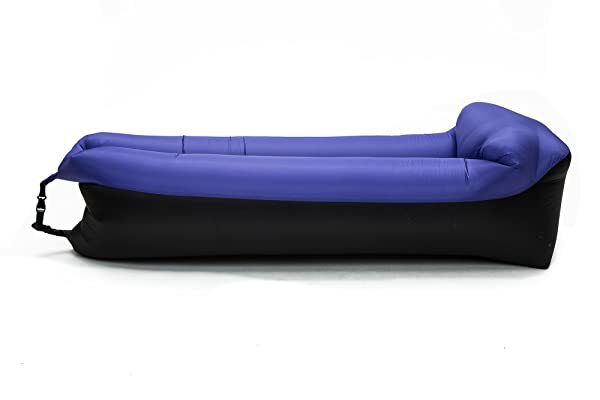 ChillaX is a nylon air lounge that is very easy to inflate on a windy day and is also quite comfortable. The sturdy material ensures that you get to use it for a long time and it also floats on water to give you more options for using it. Unlike most others, it also comes with a headrest to add to the comfort and three pockets that you can utilize to store a book, phone, and your drink so that you never have to keep on standing up. Also, you do not have to worry about the wind blowing it away because it comes with a stake. It is also important to know that it will not keep air for several hours and it can get quite hot on a sunny day. But, it is still an excellent air lounge that will help you relax and enjoy the outdoors.